Here in this timbered, steep, up and down country of Idaho, the forces at work are not merely wind and water. Here, the tumble of rocks and cracking of large trees has been important to shaping river habitat for centuries. Avalanches are not just territory for the backcountry skier. 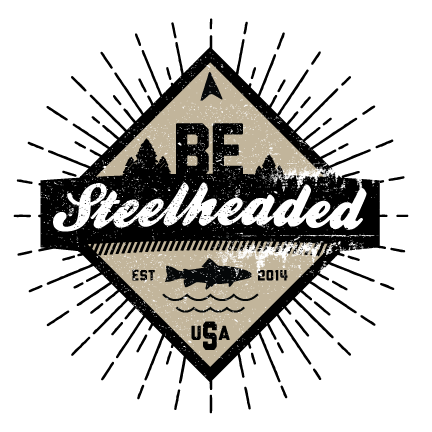 They’re good for steelhead too. Think of them like door-to-river bank service: A vehicle which brings woody debris, large boulders and smaller spawning gravels dropping them off right at river’s edge. 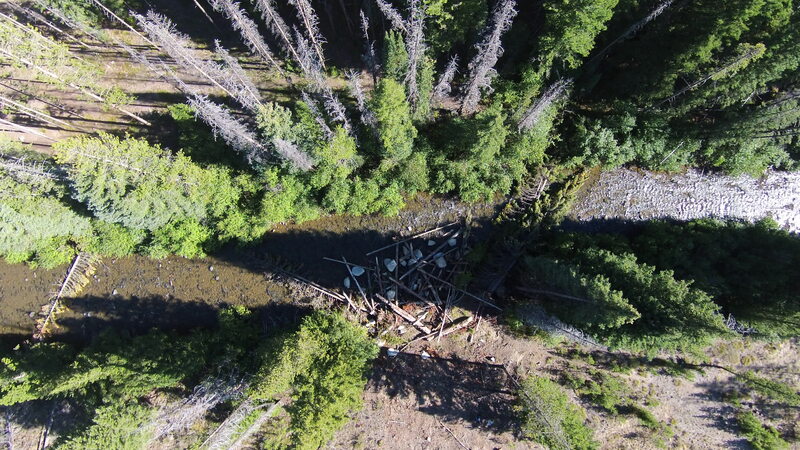 This is part of the Large Wood Project that included the 728 pieces of large wood (unanchored) over 7.4 miles of the Yankee Fork. The picture shows 2 large trees that were designed to capture moving wood. There were 3 debris flows installed mimicking events that typically happen because of short bursts of large amounts of rain in a small drainage especially post-fire, which include wood, rock and sediment. Using that concept, Trout Unlimited decided to put the power of the avalanche to work in Idaho. The team is improving habitat on the Yankee Fork by identifying places where a slide likely would have occurred. Then, they re-create it. 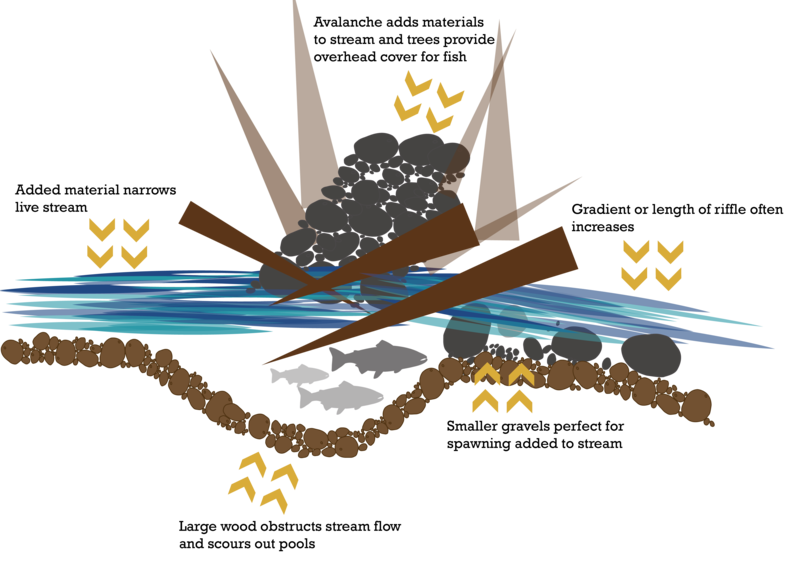 Rocks and trees are placed at key points in the river to mimic natural forces.The result is additional cover, scouring out of large pools for fish to hold and the addition of smaller gravels ideal for spawning. In the end, it becomes a healthier, more productive river. 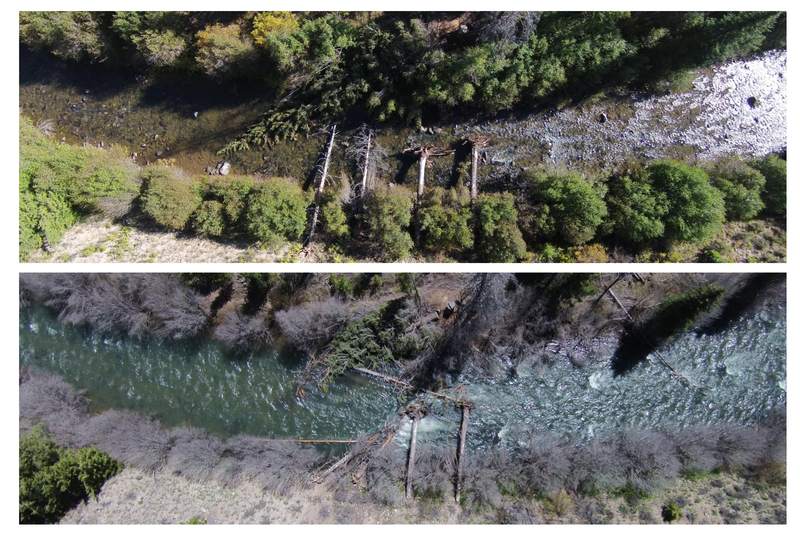 This is an aerial photo looking down on a simulated debris flow on the main Yankee Fork. This photo was taken right after the structure was installed with a trackhoe. Boulders and trees were added to the stream and bank to simulate a debris flow that would likely occur in this area due to an isolated intense rain event in a steep side canyon.